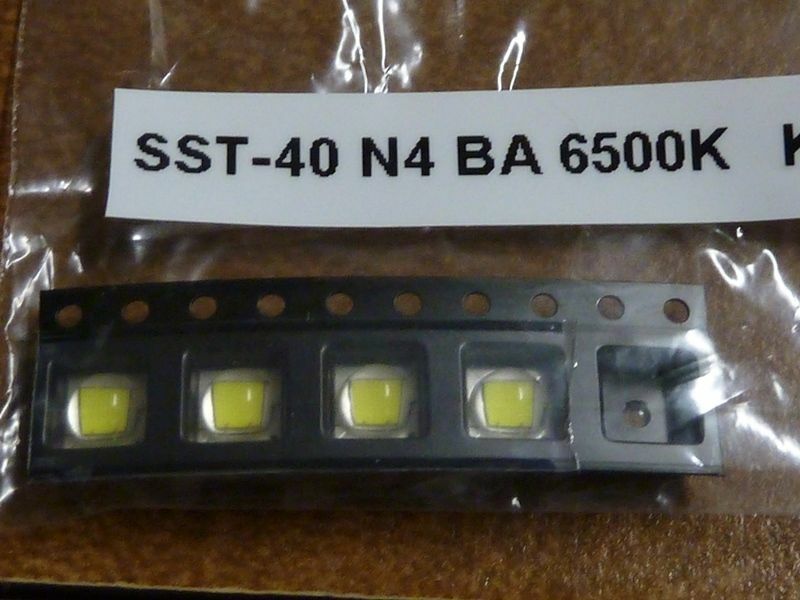 In the CK vs lumintop race to see who can make an anduril powered tail switch light first it looks like it’s CK 1, LT 0! In case you’re not impressed cause you don’t know what the folomov 18650s is; the driver is at the tail with the e-switch mounted on it. No wires or secondary tubes connect the head and tail. 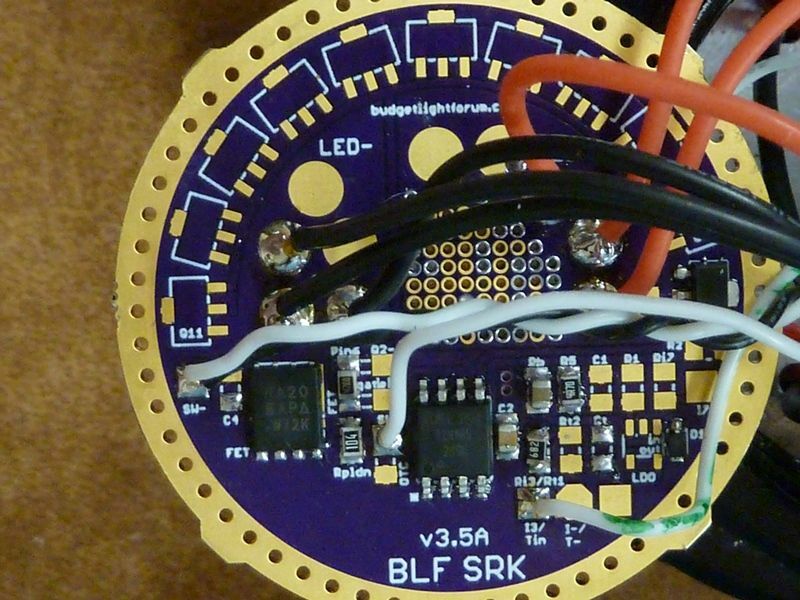 Power is supplied via a bleed resistor at the head, the LED- output on the driver goes back into the body. This driver could potentially be a drop in replacement for any clicky light to convert to e-switch! Excellent mod CK!!! Where’s the group-buy on your new driver? I need something like 8 of them!!!! Nice CK, you did it!! A while back I modded a FandyFire SP03 with 3 SST-40 N4's from KD, and a HQ SRK v3.5A driver in a FET+1 configuration. I used 2.5" 20 AWG wires but extended them with 3" of 26 AWG wires to add resistance. 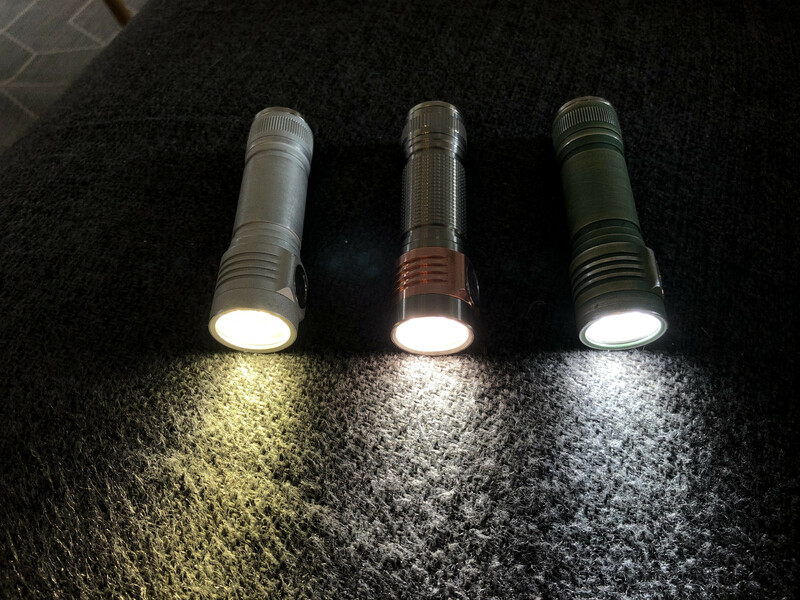 I still hit 8092 lumens at start, 6834 at 30 secs, and 257 kcd (manufacturer lumens) . Also modded a SupFire L1 with 5 SST-40 N4's from KD. 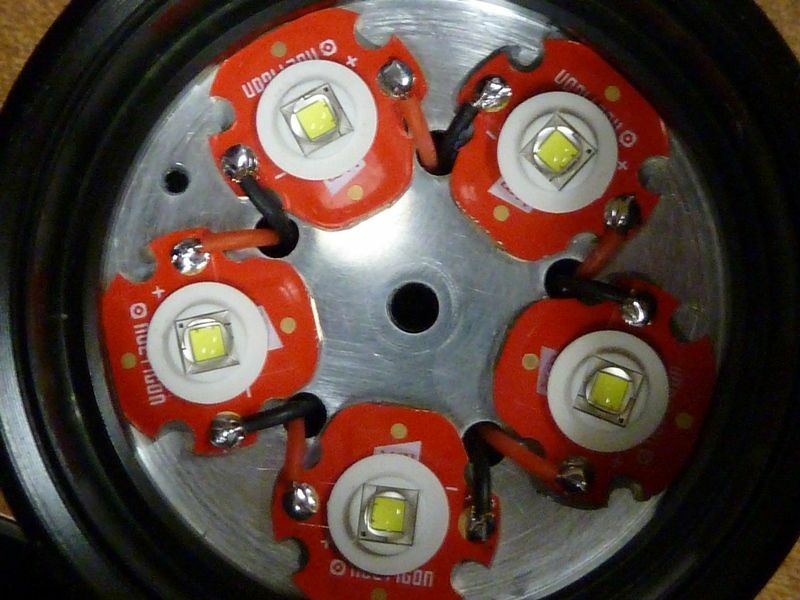 This time I used 3.5" of 25 AWG LED wires, a Q8 driver modded with an Infineon FET. Measurements were a little strange between 35E's and 30Q's. The 35E's actually hit the highest numbers: 12510 lumens at start, 10780 at 30 secs, 134 kcd (manufacturer lumens). Is 10K possible in a Q8 or any quad using SST-40's? 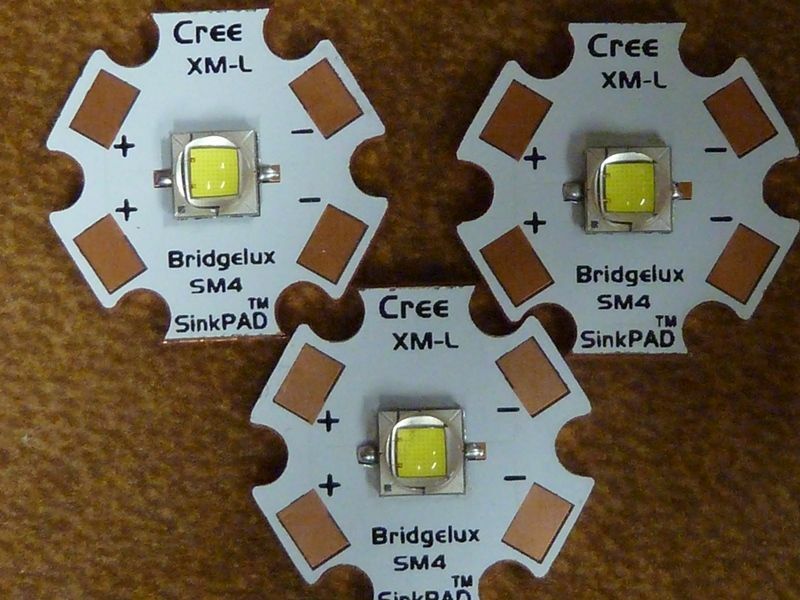 Sure is, based on these #'s with higher resistance LED wires. Springs are bypassed to avoid melting. Today I finished a thrower project with Nicolaas’ TN31. 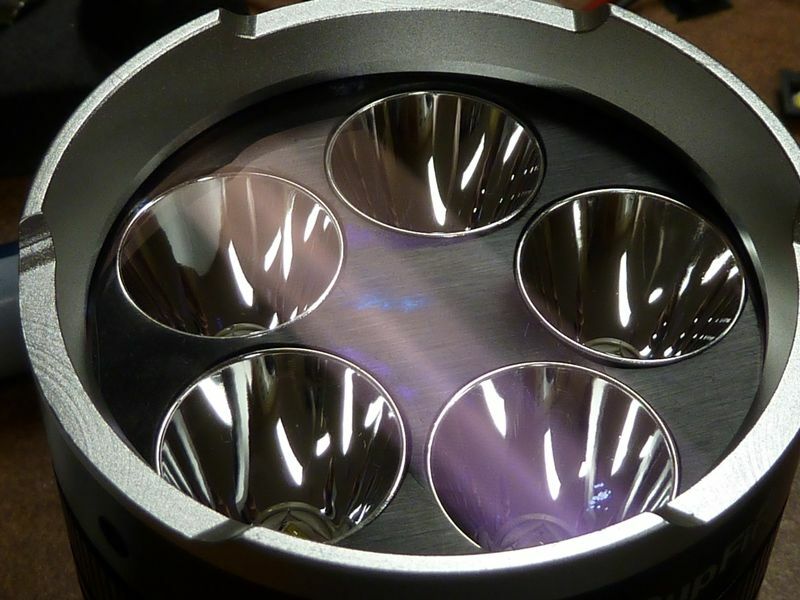 It was already converted to an aspheric thrower by Kenji, now it has a new led on a 20mm board and a wavien collar. I did not make a lot of pictures because it was a mod for Nicolaas and I did not think about posting it before now. *a XP-G2 S4 2B old style was refowed on a 20mm DTP boardcand hot dedomed. 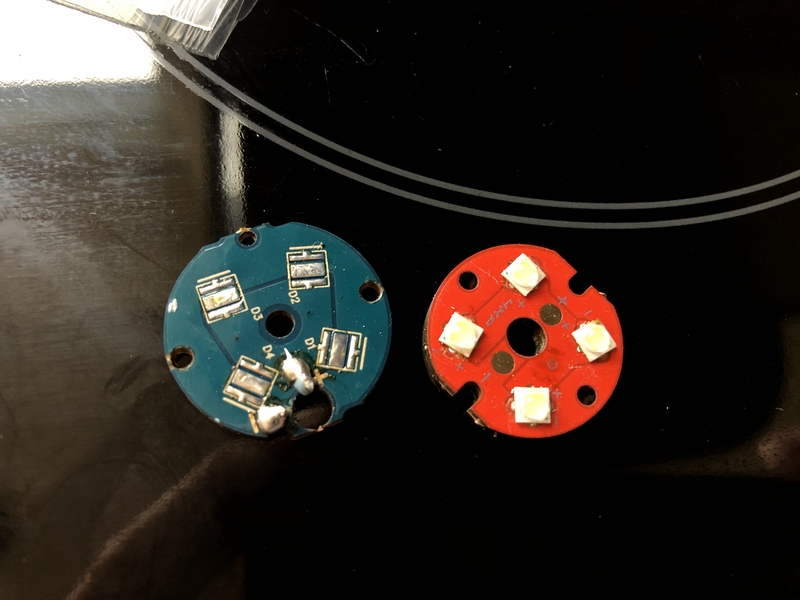 *the board was glued with Arctic Alumina Adhesive centered on the shelf in the TN31 (after the previous conversion the TN31 has a (sort of) flat 35mm diameter shelf). 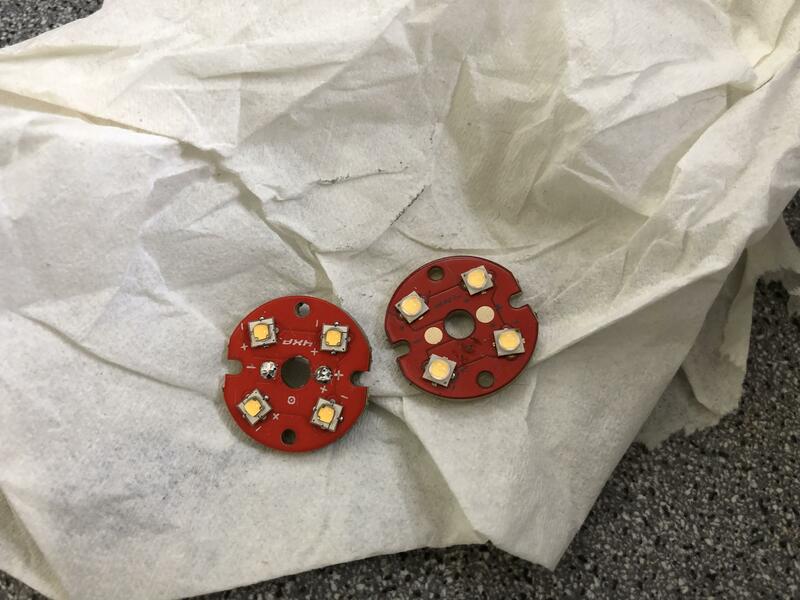 *a contraption was made from soldered together brass rings for the collar (from Enderman’s group buy) to sit on the correct height, while clearing the led wires (the ring is upside down on the photo). The 4 posts were bit by bit sanded down until the focus of the collar was perfect, as tested with the led in moonlight mode. *To handle the collar during all the adjustments deep inside the cavity (in-out-in-out etc.) I glued a copper handle on top of the collar with Norland64. The handle is not in the light path and was simply left in place inside the final modded light. 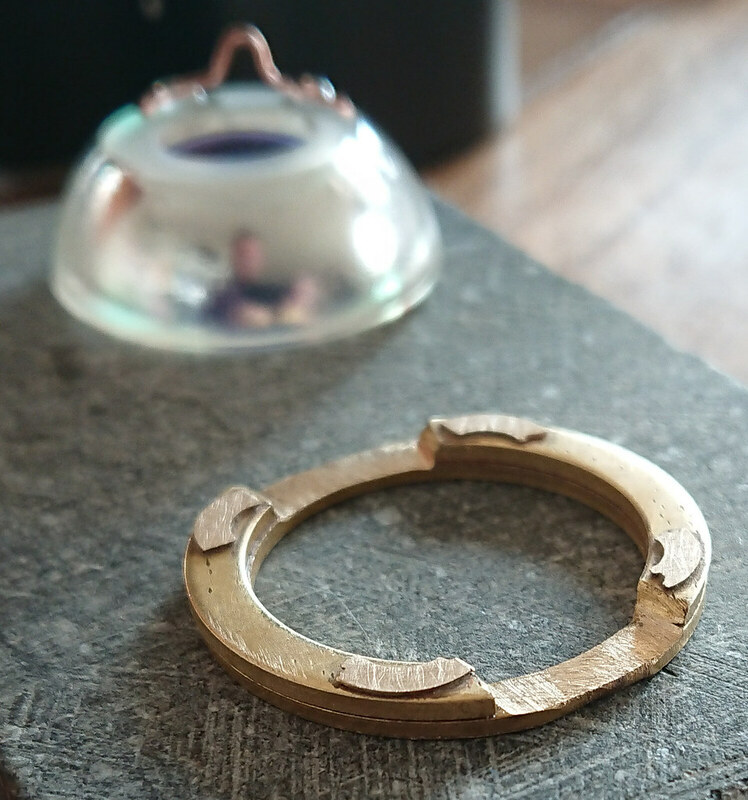 *after the focus was established as correct, the brass ring was glued on the shelf with a very thin layer of Arctic Alumina Adhesive to not alter the focus. *two very small drops of Norland 64 were applied on the edge of the collar, the collar was placed on the brass ring, it was shifted until the reflected image of the die was perfectly projected on top of the die, then the Norland was cured with lots of 365nm UV light. 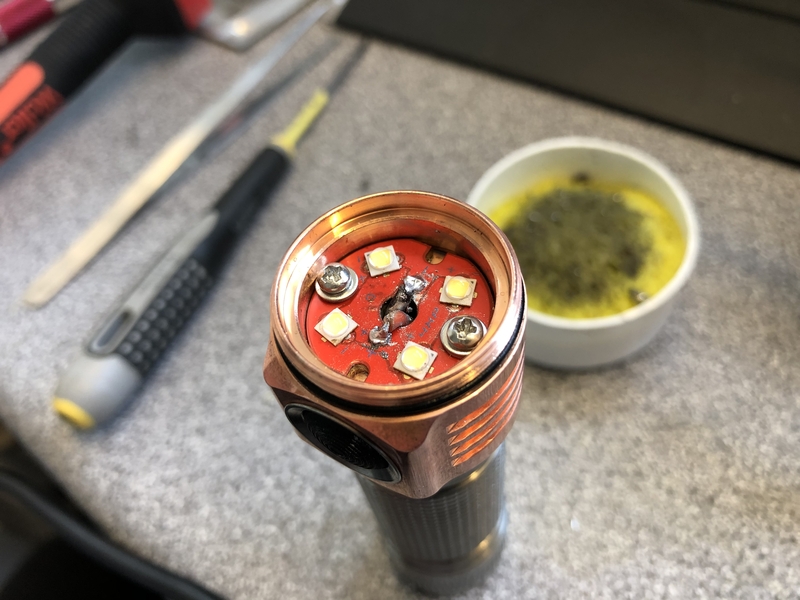 *With everything lightly glued into position, the TN31 was assembled with the aspheric lens to check if the beam was correct and as expected, which fortunately it was. *Then the head was opened again and three generous blobs of hot glue (the hot 180degC version) were applied for a more permanent fixation of the wavien collar. 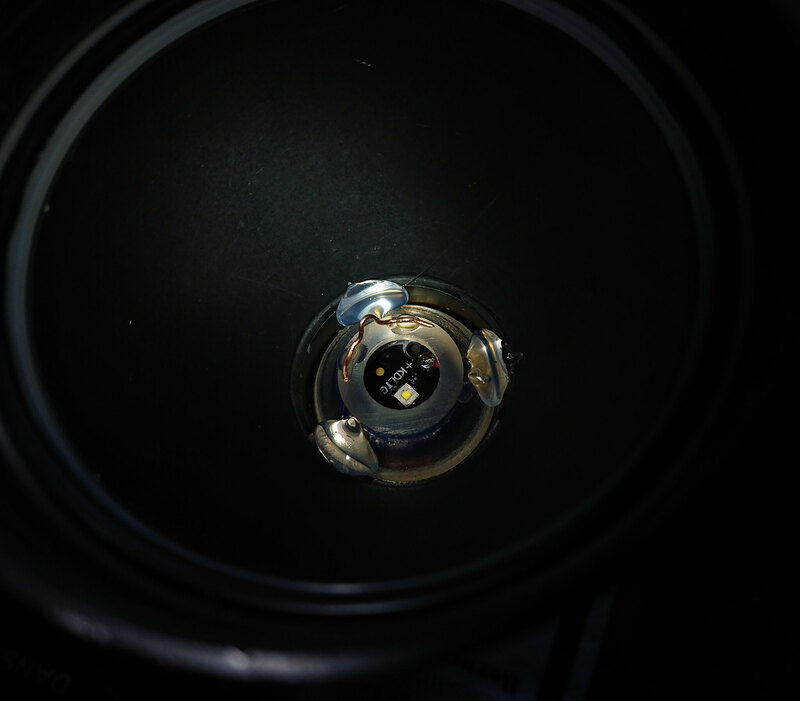 *made an effort to clean the aspheric lens as well as possible and closed the light. We measured the modded TN31 as well as possible, even checking it against other modded throwers that I measured before to see if the setup was still correct, and we got 1.31 Mcd after 30 seconds, measured at 7 meter distance ( ). That is an almost exact doubling of throw compared to before adding the collar (650 kcd). That's outstanding Jos - 1.3 mcd from a big classic thrower! Wonder if the conversion to an aspheric made much difference. From what I recall, a good dedomed XM-L2 in a TN31 with resistors bypassed did ~600 kcd at best, but of course you can't collar a reflector. I totally missed the group buy on the collars - would have been in on it. That’s outstanding Jos – 1.3 mcd from a big classic thrower! Wonder if the conversion to an aspheric made much difference. From what I recall, a good dedomed XM-L2 in a TN31 with resistors bypassed did ~600 kcd at best, but of course you can’t collar a reflector. I totally missed the group buy on the collars – would have been in on it. And I would have bought 2 of them now that I have some experience (two succesful mods) in how to use them and see how well they work. 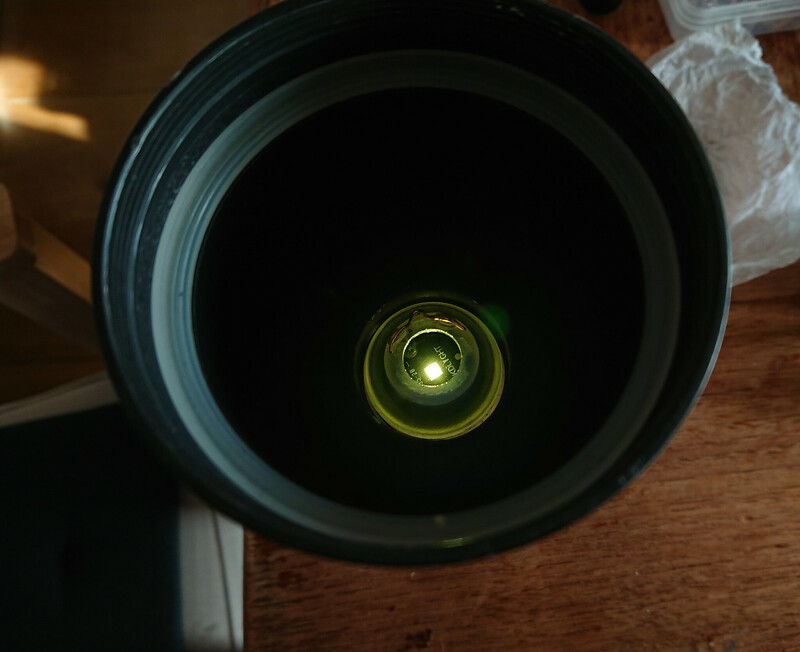 The quality of Nicolaas’ lens is ok but not great btw, I reckon if a lens of the quality of the JaxmanZ1/Cometa was used (better optical quality plus coated), the results would be even significantly better. You might be able to persuade me to hand my second collar over to you………. And thanks again for this fantastic modd! The light output is green as hell but 1,3Mcd from a light in this size……who cares! I’m alright Nico, it is more greediness than that I have any idea what mod to do with it. Yeah well, not too many aespheric light in which the collar fits. What remains is to completely customize a big reflector light, but it’s a tall order to find a fitting lens with the correct focal length of a decent quality at a fair price. Should correct my post above, but by today's standards, the TN31 is a medium or moderate size thrower, but back then, it was "the" thrower. Interesting bout the quality of the lens... Reminds me of the MEM custom builds, and his persistence with finding the ultimate quality lens. Still wish he was still around - wonder if they legally slammed him or something, banned or gagged from using his own invention. Meadowstar: http://www.meadowstar.com/, over 200 patents, mostly bought (cough, cough). Someone should declare open-season on alla them. All those parasites do is hinder progress, the exact opposite of what patents are supposed to reward. Replace rubber boot on Surefire G2 into blue one and add GITD tape inside several flashlight’s heads. Sorry for crappy cellphone pic. Since my FF PL47 didn’t live up to the expectations, it was scrapped. But I had to give those lovely 219B emitters a new home. 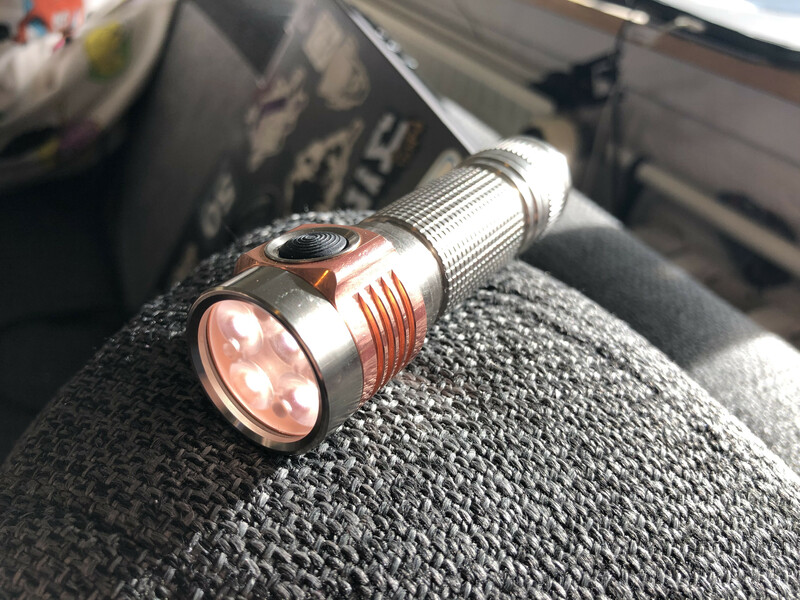 So I finally pulled the trigger on the Titanium version of the Emisar D4. Then I gathered all my courage and gave my first ever reflow a go. 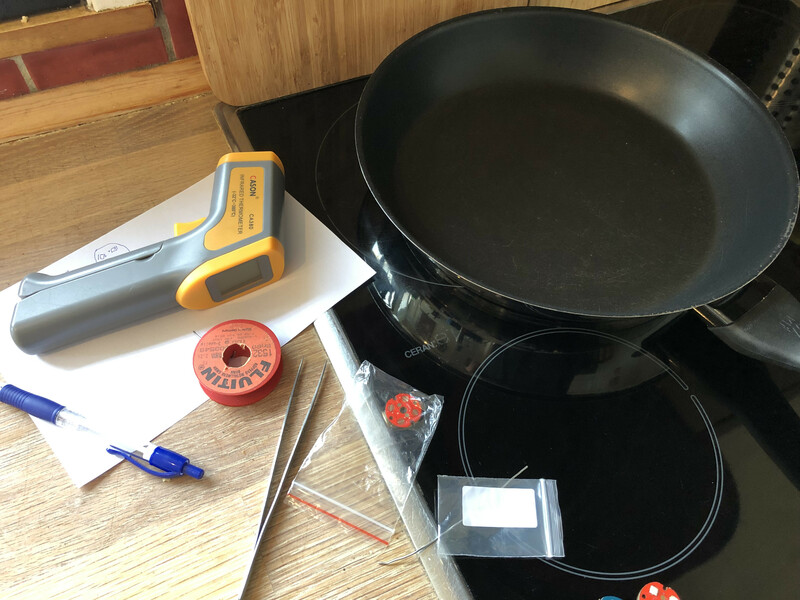 Old teflon frying pan, IR thermometer for hitting the right temperature on the stove. And then it happened, the emitters came loose, and i swapped them over to the empty 4XP V2 MCPCB. Added way too much paste, but it spilled out when giving them a little squeeze. Did a quick test with my DMM, GREAT SUCCESS! All four emitters lit up. Then the usual procedure of D4 driver disassembly, flashing Anduril to the driver. Not my finest solder job, but I was eager to power it up. Was excited to see if my reflow would hold on full power. And it freggin did, yay! XP-G2 is a little less yellow IRL, but the nichias a pretty spot on. Look at that rosy goodness. Well done i42dk! Reflowing is indeed much easier than you would think. Hopefully this motivates more people to do their first reflow. Great job! My first ever reflow was also with the help of a skillet/stove. Then graduated to electric stove (without skillet) and eventually hot air rework station. Once you get the hang of it, it can be really fun. I can see them now, awesome! This may but be a huge thing to many, but I finally got around to setting up an Anduril build environment yesterday. An Ubuntu VM running on Windows. I downloaded TK’s repository, and started figuring out how to use it. I couldn’t find any guides, so I just winged it, downloading dependencies as they came up. After some time, I got a basic standard Q8 hex to build! I was ecstatic! I started fiddling with the settings, and managed to add/remove features with ease. Even figured out how to change the rythm of the new fancy button blink with a hint from TK herself. I was super stoked. I had put a few hours in tinkering around, and decided to take a break. Then later, I knew what I wanted to do. After modding me and my buddies H03s with a Lexel TA driver last year, we wanted Anduril, but a 3 channel + aux LED version hadn’t been built yet. Zeroflow was kind enough to build me one, and gave me the documentation and modded build files of I ever wanted to try it myself. I wanted to try it myself, to get the new fancy button blinking on my H03. So that is my latest modding story. I know I’ve got a long way to go, and more to learn about how all this Anduril code works, but I’m making progress! And I’m extremely happy! Thanks to everyone here for all your hard work! None of this would be possible without all of you. I really appreciate you all. Just fyi, I've built Anduril successfully in Atmel Studio on Windows - you don't need a Ubuntu VM on Windows to build it. It's a much more comfortable environment for me, but of course I work in VS 2017 every day, and Atmel Studio is based on an older version of Visual Studio. Just fyi, I’ve built Anduril successfully in Atmel Studio on Windows – you don’t need a Ubuntu VM on Windows to build it. It’s a much more comfortable environment for me, but of course I work in VS 2017 every day, and Atmel Studio is based on an older version of Visual Studio. 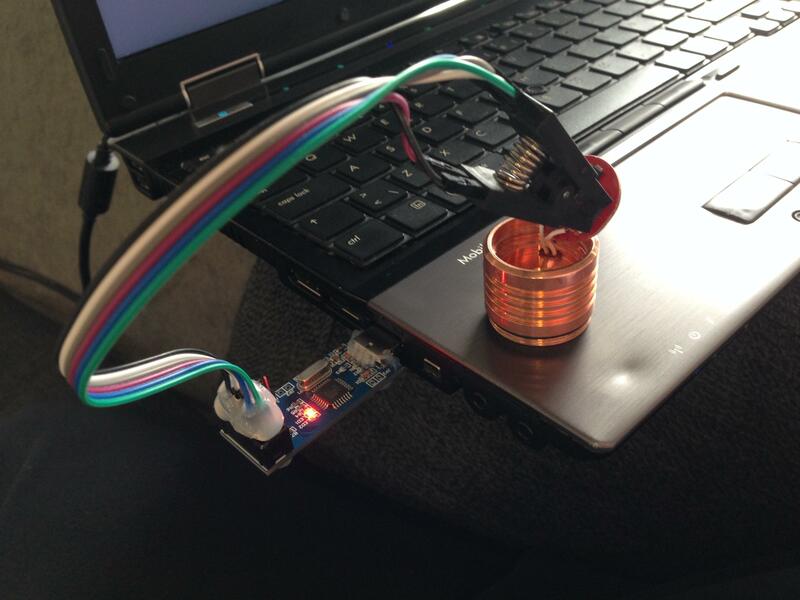 I did try atmel studio last year during the first go around. But I couldn’t even get standard unedited files to work. They would build, but had strange problems, and if they even flashed they didn’t actually run. I’m fairly comfortable in a Linux environment, used to use it more often than I have in the last few years. But I’m more comfortable in a command line than I am in a powershell. I think TK actually recommends a Linux environment, and it works pretty well. Thanks! I did try atmel studio last year during the first go around. But I couldn't even get standard unedited files to work. They would build, but had strange problems, and if they even flashed they didn't actually run. I'm fairly comfortable in a Linux environment, used to use it more often than I have in the last few years. But I'm more comfortable in a command line than I am in a powershell. I think TK actually recommends a Linux environment, and it works pretty well. Sure I did a lot of research; how hot it should be, tools to use etc. And the new MCPCB surface text changed color due to too much heat. So naturally, I measured the stock M22 : 2,9A and the advertised 23kCd from the XM-L2. 4,5A and 220kCd, not as good as my D1S (260kCd) but the reflector is known to be far from perfect so I’m quite pleased with that result !